Honey is the basis of mead. But honey alone can be difficult to ferment. Making a fruit mead (or melomel) is a great way to get started with meadmaking. Here is a mead recipe for first time meadmakers who would like to try something with a high probability of success. One problem with making mead from honey alone is that there may not be enough potassium in the honey to sustain a healthy fermentation. 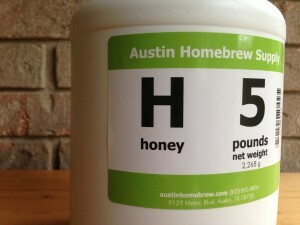 Additionally the pH of an all-honey mead must may initially be too low. This recipe combines honey with cherries, a fruit with relatively high potassium levels, and whose juice is in a suitable pH range. (The pH of sweet cherry juice ranges from 3.8–4.5). It also contains a small amount of grape juice, which also has fairly high potassium levels and whose juice pH will work well in a wine-like fermentation. (Most wine is made from grapes.) Even if the pH of the honey is low, the fruit juices are more highly-buffered, so it will not be a problem. One thing that might make beer brewers nervous is the lack of sanitation. The mead must is not boiled, nor are Campden tablets used to inhibit microorganisms, as in winemaking. The “dump and stir” method, advocated by Ken Schramm and employed here, works if you keep everything that goes into your must or contacts the fruit as clean as possible. This recipe uses staggered nutrient additions to speed the fermentation along. Mead does not require fermentations that span for 6 or more months, as was the norm in “old school” meadmaking. If the yeast are fed nutrients as they need them, and in the right quantities, a mead fermentation can proceed nearly as quickly as a beer fermentation and aging may take only several weeks. Although this is a “beginner’s” recipe, the quality is not substandard. If you use fresh, flavorful cherries and quality honey, following the instructions here will produce a wonderful mead. Meads made with fruit are called melomels, so you can call this either a cherry mead or a cherry melomel. (Meads made from only honey and grapes are sometimes called pyments.) This produces a mead of 12% ABV. It’s strong, but not so strong that it will tax the wine yeast and lead to a prolonged fermentation. If you’re interested in mead and have been looking for a place to start, consider this recipe. A semi-sweet mead, flavored with cherries, at around 12% ABV. This is a great mead for beginning meadmakers as many of the problems associated with making mead from only honey are avoided. Measure out 1.0 gallon of water and pour it into a bucket fermenter. Mark this level on the outside of the bucket with a Sharpie (or other permanent marker). Pour water out and sanitize the bucket fermenter. Rinse the cherries and pit roughly half of them. Cut the remaining half in two with a sanitized knife on a sanitized cutting board. Place them in a nylon steeping bag and let them sit (on the cutting board) until you are ready for them. Mix the two yeast nutrients together and put them in a labelled Ziplock bag (or any other convenient container). Make grape juice per directions on can in a sanitized pitcher and pour 1/3 of the juice (16 oz.) into the bucket. (Alternately, slide frozen juice out of can, cut to divide the cylinder into two pieces, one 4 oz. and one 8 oz. ; add the smaller chunk to the fermenter.) Pour honey into fermenter. Add water and stir to make 1.0 gallon of solution, with honey mixed in well. Add yeast. (You can sprinkle about half of a 5 g sachet onto the top of the liquid or rehydrate the yeast and add roughly half of the slurry. If you sprinkle, give the yeast about 15 minutes to rehydrate before proceeding.) Stir yeast into mix and add 1/4 tsp of your yeast nutrient mix. Tie steeping bag loosely and dunk cherries into liquid. (At this point, you’ll have over a gallon in volume at around SG 1.100; SG 1.102 once the sugar from the cherries dissolves.) Seal bucket and attach airlock. Let ferment at “room temperature” (around 72 °F). Remove lid when vigorous fermentation is evident and add another 1/2 tsp. of yeast nutrient. Reseal and let fermentation go to completion. Additionally, for the first several days when fermentation is evident, open the fermenter once a day and punch the cherries down below the surface of the water. (You can use a sanitized potato masher or a large sanitized spoon.) Reseal when done. Stop doing this when fermentation is no longer evident from bubbling in the airlock. Once bubbling in the airlock stops, let mead sit for about a week to 10 days. Sanitize a 1-gallon jug and a racking cane (or tubing if the bucket has a spigot). Open the fermenter and gently lift the bag of cherries. Spin the bag lightly to push some of the liquid out of the solids. Let whatever liquid that easily flows from a small amount of pressure drain into the mead. Don’t try to wring every last drop of liquid out. Rack mead to 1-gallon jug and affix airlock. Let mead sit for about a month in a cool, dark place. Then, start checking it’s clarity every two weeks or so. When it has fallen clear, bottle it. If a lot of sediment appears initially, you may need to re-rack the mead to another gallon jug to speed clearing. You can choose any light-colored honey variety you like. Another fruit worth considering is strawberries. These are also fairly high in potassium. If using strawberries, add 2.5–3.0 lbs (1.1–1.4 kg). You can also try peaches, using 2.5–3.0 lbs. (1.1–1.4 kg) and using white grape concentrate for the grapes. Don’t use tart cherries as this will drive the pH down. You can also use white grape concentrate or grape juice from wine or table grapes or the juice from a wine kit. If using grape juice, add 16 oz. (470 mL). Other yeasts that would work well would be Wyeast 4184 (Sweet Mead), White Labs WLP720 (Sweet Mead/Wine), any Champagne yeast, Lalvin EC-1118 or most other white wine yeasts. Measure out 3.8 L of water and pour it into a bucket fermenter. Mark this level on the outside of the bucket with a Sharpie (or other permanent marker). Pour water out and sanitize the bucket fermenter. Pit roughly half of the cherries. Cut the remaining half in two with a sanitized knife on a sanitized cutting board. Place them in a nylon steeping bag and let them sit (on the cutting board) until you are ready for them. Mix the two yeast nutrients together and put them in a labelled Ziplock bag (or any other convenient container). Make grape juice per directions on can in a sanitized pitcher and pour 1/3 of the juice (470 mL) into the bucket. (Alternately, slide frozen juice out of can, cut to divide the cylinder into two pieces, 1/3 and 2/3 the total; add the smaller chunk to the fermenter.) Pour honey into fermenter. Add water and stir to make 3.8 L of solution, with honey mixed in well. Add yeast. (You can sprinkle about half of a 5 g sachet onto the top of the liquid or rehydrate the yeast and add roughly half of the slurry. If you sprinkle, give the yeast about 15 minutes to rehydrate before proceeding.) Stir yeast into mix and add 1/4 tsp of your yeast nutrient mix. Tie steeping bag loosely and dunk cherries into liquid. (At this point, you’ll have over 4 L in volume at around SG 1.100; SG 1.102 once the sugar from the cherries dissolves.) Seal bucket and attach airlock. Let ferment at “room temperature” (around 22 °C). Remove lid when vigorous fermentation is evident and add another 1/2 tsp. of yeast nutrient. Reseal and let fermentation go to completion. Additionally, for the first several days when fermentation is evident, open the fermenter once a day and punch the cherries down below the surface of the water. (You can use a sanitized potato masher or a large sanitized spoon.) Reseal when done. Stop doing this when fermentation is no longer evident from bubbling in the airlock. Once bubbling in the airlock stops, let mead sit for about a week to 10 days. Sanitize a 3.8-L jug and a racking cane (or tubing if the bucket has a spigot). Open the fermenter and gently lift the bag of cherries. Spin the bag lightly to push some of the liquid out of the solids. Let whatever liquid that easily flows from a small amount of pressure drain into the mead. Don’t try to wring every last drop of liquid out. Rack mead to 3.8-L jug and affix airlock. Let mead sit for about a month in a cool, dark place. Then, start checking it’s clarity every two weeks or so. When it has fallen clear, bottle it. If a lot of sediment appears initially, you may need to re-rack the mead to another gallon jug to speed clearing. Could this recipe be adjusted for tart fruits? Like raspberries? Is there enough potassium in the grape juice to make up for the low levels in the berries? Yes, raspberries can be wonderful in mead. Use less as they are more intensely flavored than cherries. The potassium levels in the grapes , the other fruit, and the yeast nutrients should be enough. I have mine racked into the final jug. Can we get a picture of just how clear this will get? It was obvious on Joe’s ancient Orange mead, but with all that color on this mead, I don’t feel like I will ever be able to look all the way through. When you say cut half the cherries in half, do you de-pit them then? or just cut them in half and through it all in?